In honor of this anniversary of H.P. Grice’s birth on March 13th, 1913, let me share an undergraduate paper I had an especially good time writing. For a much less slang-littered and more complete exploration of his ideas, Richard E. Grandy and Richard Warner have written an excellent profile of this brilliant philosopher of language for the Stanford Encyclopedia of Philosophy. Enjoy! “George Bernard Shaw near St Neots from the Millership collection” from the Birmingham Museums Trust, CC BY-SA 4.0 via Wikimedia Commons. Born in Dublin on 26 July 1856 to a father who held heterodox religious opinions and a mother who moved in artistic circles, Shaw was perhaps bound to be unconventional. By age 19 he was convinced that his native Ireland was little more than an uncouth backwater–the national revival had yet to see the light of day–so he established himself in London in order to conquer English letters. He then took his sweet time to do it. 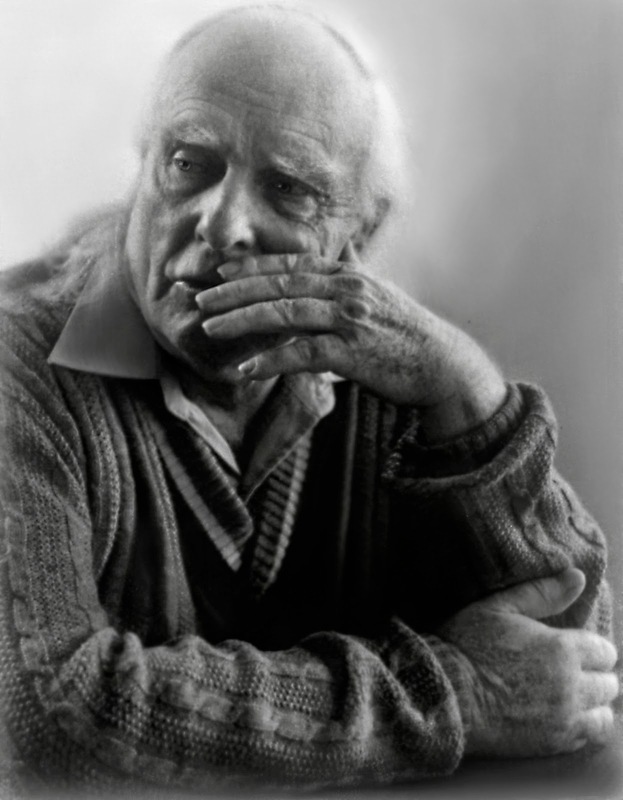 In the roughly quarter of a century between his arrival in the metropole and when he finally had a modicum of success, Shaw wrote five novels–most of which remained unpublished until his later years–and eked out a living as a journalist, reviewing music, art, books, and theatre. That eminently readable journalism has been collected in many fine editions, and we see in it an earnest individual not only engaged in assessing the qualities of the material before him–much of which was dreadfully insipid–but eager to raise standards and to cultivate the public. He prodded people to want more and gave them the tools to understand what a better art would look and sound like. And he did so in an inimitable voice that fashioned his renowned alter ego: the great showman and controversialist, GBS. 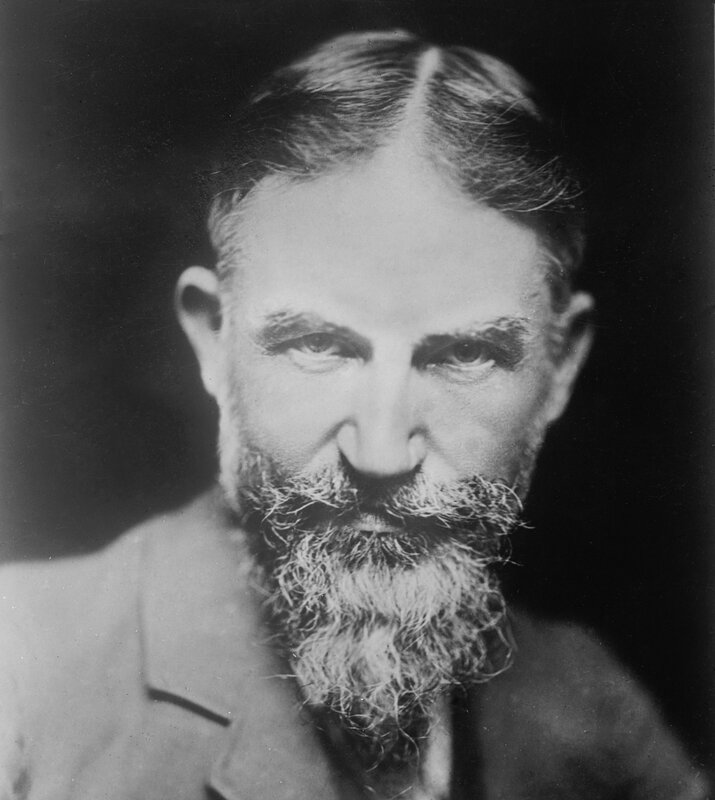 “George Bernard Shaw, circa 1900” from the Library of Congress, Public Domain via Wikimedia Commons. Shaw became more widely known as a playwright in late 1904, when King Edward broke his chair laughing at the Royal Command performance of Shaw’s play John Bull’s Other Island. He was no longer a journalist by trade, now being able to live by his plays, but Shaw continued to write essays, articles, and letters-to-the-editor in leading papers to set the record straight, to denounce abuses of power, and to suggest more humane courses of action. When he published his plays, he wrote polemical prefaces to accompany them that are sometimes longer than the plays themselves. These prefaces, written on an exhausting range of subjects, are equally learned and entertaining. Indeed, it has been said by some wags that the plays are the price that we pay for his prefaces. In many ways continuing his fine work as the Fabian Society’s main pamphleteer in the 1890s, his prefaces suggest remedies for the great injustices of his time. And, what’s more, the vast majority of his prescriptions are as topical and provocative today. For example, if you’re American, should you opt for Trumpcare or Obamacare? Read The Doctor’s Dilemma and its preface and you’ll have a compelling case for neither, but rather a comprehensive and fully accessible public healthcare system, the sort now common in Canada and most European countries. That’s right, people were feeling the Bern–we might say the original Bern–well before Mr. Sanders was born. Some of Shaw’s opinions came at a great cost. 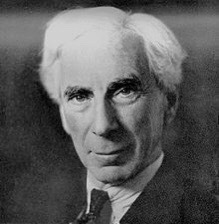 When he published Common Sense About the War, which was critical of both German and British jingoism at the outset of the Great War, he ran too much against the grain of the hyper-patriotic press and government propaganda, thereby becoming a pariah to many. But his star gradually returned into the ascendant as the body count mounted and a war-weary population came to share his point of view. The run-away international success of Saint Joan brought him the Nobel Prize for Literature in 1925 and, as Shaw said, gave him the air of sanctity in his later years. 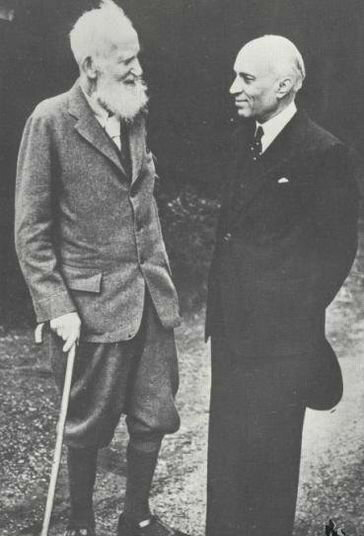 “George Bernard Shaw with Indian Prime Minister Jawaharlal Nehru, May 1949”, from Nehru Memorial Museum & Library. Public Domain via Wikimedia Commons. However, Shaw always maintained that he was immoral to the bone. He was immoral in the sense that, as a committed socialist in a liberal capitalist society, he didn’t support contemporary mores. Instead, he sought to change the way that society was structured and to do so he proposed absolutely immoral policies. A good number of these beyond universal healthcare have seen the light of day, such as education that prioritises the child’s development and sense of self-worth, the dismantling of the injustices of colonial rule, and voting rights for women. But those in power continue the old tug-of-war, and the intellectuals of today must be as vigilant, courageous, and energetic as Shaw in the defence of liberal humanist and social democratic values. Witness the return of unaffordable tertiary education in the UK, made possible by both Labour and Conservative policies. We might recall that Shaw co-founded one of these institutions–the renowned London School of Economics–because he believed in their public good. Whenever Shaw toured the globe in his later decades–he died in 1950 at age 94–he was met by leading politicians, celebrities, and intellectuals who wanted to bask in his wit, wisdom, and benevolence (Jawaharlal Nehru, Charlie Chaplin, and Albert Einstein are a few such people). Time magazine named him amongst the ten most famous people in the world–alongside Hitler and the Pope. Everywhere he went, the press hounded him for a quote. Yet despite the massive fees he could have charged, he never accepted money for his opinions, just as he had declined speaking fees in his poorer days when he travelled Britain to give up to six three-hour lectures a week to praise the benefits of social democracy. He would not be bought–or suffer the appearance of being bought. On his birthday, then, we would do well to think of Shaw and maybe even read some of his plays, prefaces, or journalism. We might also cherish the service and immorality of intellectuals. And we should always question the motives of those who denigrate their value. I get apprehensive whenever someone asks me about my job. I’m a philosopher who works on the question of how language evolved, I reply. If they probe any further, I tell them that I work with the great apes at Leipzig zoo. But some people, I’ve discovered, have big problems with zoos. Plenty of philosophers and primatologists agree with them. Even the best zoos force animals to live in confined spaces, they say, which means the animals must be bored and stressed from being watched all the time. Other critics claim that zoos are wrong even if the creatures aren’t suffering, because being held captive for human entertainment impugns their dignity. Such places ‘are for us rather than for animals’, the philosopher Dale Jamieson has written, and ‘they do little to help the animals we are driving to extinction’. But I want to defend the value of zoos. Yes, some of them should certainly be closed. We’ve seen those terrible videos of solitary apes or tigers stalking barren cages in shopping malls in Thailand or China. However, animals have a good quality of life in many zoos, and there’s a strong moral case for why these institutions ought to exist. I’ve come to this view after working with great apes, and it might not extend to all species equally. However, since great apes are both cognitively sophisticated and human-like in their behaviour, they offer a strong test case for evaluating the morality of zoos in general. The research my colleagues and I conduct isn’t harmful to the animals and, if it goes well, it will help us get a better grasp on the cognitive differences between humans and apes. For example, we did a study with pairs of orangutans in which we tested their ability to communicate and cooperate to get rewards. We hid a banana pellet so that one orangutan could see the food but couldn’t reach it. The other orangutan could release a sliding door and push the pellet through to her partner, but wasn’t able to take it for herself. They did okay (but not great) when playing with me, and they mostly ignored each other when playing together. We then performed a similar set of studies with human two-year-olds. Compared with the apes, the two-year-olds were very good at getting the reward (stickers) when they played with an adult. The value of research aside, there’s an argument for zoos on the grounds of animal welfare. In the best zoos, such as Leipzig, great apes live in spacious enclosures modelled on their natural habitats, and are looked after by zookeepers who care about them deeply. Large jungle gyms keep them stimulated and stave off boredom; they’re also kept busy with ‘enrichment’ puzzles, which they can unlock with tools to get food. Zoos recognised by the two main accrediting bodies in Europe and the United States are rigorously vetted and required to take part in education and conservation programmes. And there’s no solid evidence that apes living in well-designed enclosures get stressed or disturbed by human observation. Of course, zoos can’t provide their animals with conditions such as those in an untouched forest. But for the great apes in captivity, there’s rarely a viable alternative. There are estimated to be more than 4,000 great apes living in zoos worldwide. Most of the regions where they are found in the wild – orangutans in Indonesia, chimpanzees and gorillas in Central and West Africa, bonobos in the Democratic Republic of Congo (DRC) – are ravaged by habitat loss, civil war, hunting and disease. As few as 880 remaining mountain gorillas survive, in two small groups in the eastern reaches of the DRC, while orangutan habitats have declined 80 per cent in the past 20 years. While some conservationists dream of rehoming zoo apes in the wild, these vanishing forests mean that it’s rarely feasible. The orangutans in Leipzig are certainly better off than they would be trying to survive in forests razed to make way for palm-oil plantations. Since zoo apes cannot be returned to their natural environments, specialised sanctuaries are another option. But these require large plots of land that are both safe and uninhabited by existing populations, and such locations are scarce. As things stand, sanctuaries are already struggling to survive because they’re almost exclusively dependent on charitable donations. And most of them are full. In Africa and Indonesia, inhabitants are typically orphans that have been taken from the forest by hunters or palm-oil workers, who kill larger apes and kidnap the babies to sell or keep as pets. Elsewhere, sanctuaries are overflowing with retired lab apes or rescued pets. These institutions lack the capacity to accommodate the thousands of apes currently living in zoos, let alone the money that would be needed to support them. Given the obstacles and the great expense of rehoming apes, very few places try to do so. Damian Aspinall of Howletts Wild Animal Park in England leads one of the few programmes that release gorillas back into the wild, by taking them to a protected reserve in Gabon. His intentions are heroic and hopefully the plan will succeed. Some gorillas have resettled well. But the results so far have been mixed; in 2014, five members of a family of 11 were found dead within a month of their release. We also don’t really know whether zoo-born apes possess the skills they need to survive, including the ability to retrieve different local foods, and knowledge of edible plants. Young apes learn these skills in the wild by watching the knowledgeable adults around them – but that’s an opportunity that creatures in captivity simply don’t have. Now, all of this isn’t necessarily an ethical argument for continuing to breed apes in zoos. You might argue that if we can’t save the apes already in captivity, we should at least end breeding programmes and let the existing populations die out. However, captive breeding helps preserve the genetic diversity of endangered species. Moreover, research shows that visiting zoos makes people more likely to support conservation efforts – an effect that’s amplified by more naturalistic enclosures. So first-person encounters in zoos serve to educate visitors about the incredible lives animals lead, and to raise money for wild conservation programmes. Allowing the ape populations in zoos to wither assumes – without justification – that their current lives are so bad as to be not worth living. It also risks inflicting harm. Boredom is a real risk for zoo animals, and it’s widely believed (although not yet scientifically established) that the presence of infants brings both interest and happiness to the families. Mixed-aged groups create collective dynamics that more closely resemble those in the wild. If we care about the welfare of captive apes, we should allow them to breed – at least in controlled ways. One day, the prospect of returning captive apes to their natural habitats or housing them in well-funded, spacious sanctuaries might be realistic. Currently, it is not. Instead of condemning zoos, we should dedicate our efforts to supporting them: to pushing bad zoos to reform or close; to funding more research into the welfare of captive animals; and to encouraging all zoos to strive to do more for their inhabitants. That way, perhaps, I will no longer need to shy away from telling strangers what I do. ‘…Beyond tweeting, how would Plato have responded to modern changes in the way humans communicate? During his own time, people increasingly recorded their thoughts and experiences in writing, and he worried that written language reduced our reliance on memory. The tool made us less human, even mechanical, he argued, because once something was jotted down, it no longer came from within a person. It was less authentic, and therefore less true. Then again, Plato expressed this concern in Phaedrus, his dialogue that most famously grapples with the issue, by writing it down.